A worker from the SIFF turf and facilities department, Eddie Ngaitini, was in Gizo last week to start planting the specially imported Bermuda grass for the pitch surface. This is a very significant step forward for the project which is already significantly behind schedule. According to Reuben Oimae, SIFF turf manager and one of the foremost specialists in sports ground surfacing confidence is rising that JFK stadium will be completed soon. “It is a very important step for us to begin planting the grass at JFK. With proper care and attention we are looking at a completion date within the next four months, we can now see the finish line,” Oimae says. After planting the seedlings will be monitored closely and once there is significant growth cutting will begin. This, Oimae, explains is the most vital stage because the effort will be to force the grass to create a network of roots underneath the soil that will eventually form the carpet like surface required. This is done by frequently trimming the grass over a period of two months until it is mature and the roots have taken hold. “Regular trimming is required soon after growth because this will cause the individual seedlings to interlink with other seedlings and form a network. If this is not done the grass will grow individually and not form the carpet surface that we want,” says Oimae. However, while acknowledging the progress Oimae remains concerned about certain challenges that will hamper efforts. The continuous wet season in Gizo is a major issue because it will affect the growth of the grass and also slow down work. Reports that the centre of the pitch is used as a helipad has worried SIFF and authorities are being asked to nominate another site for helicopter landings. The Western Football Association has since communicated to the Western Province Government and the Regional Assistance Mission to Solomon Islands (RAMSI) that the field is restricted for helicopter landings indefinitely. 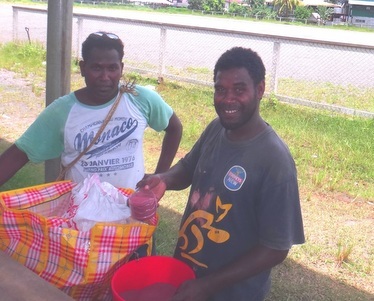 The Gizo public has also been asked to stay away from JFK stadium due to the use of fertilisers and other chemicals on the site for the seeding exercise. The JFK stadium project is funded under the FIFA Goal III program in Solomon Islands which also financed the Aligegeo football pitch project. Besides work on the pitch the project also funded the construction of technical centre which is now complete. Ground breaking at JFK was done in 2009 and SIFF along with the FIFA Development Office in Oceania have initiated a push this year to ensure the project is completed. The FIFA Goal program has had significant success in Solomon Islands. In 2000 Solomon Islands was among the first 11 countries to benefit from it with the Lawson Tama stadium upgrade under FIFA Goal I. Following the successful upgrade to Lawson Tama FIFA Goal II was initiated to build the SIFF headquarters and academy facilities in Honiara.